I am not sure if I really explained the importance of Scott Walker’s plan to rein in public sector unions in my last post. 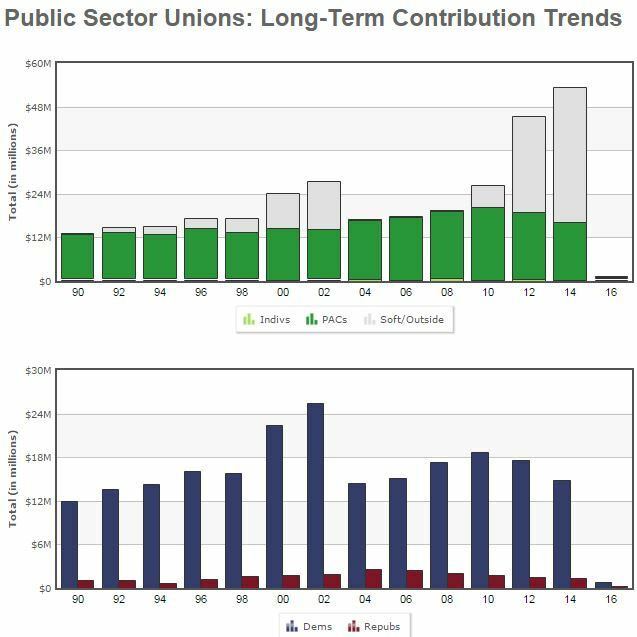 Basically, public sector unions generate a lot of money from forced collection of union dues, and they turn around and use that money to donate to politicians who are in favor of growing government. Unions want bigger government, because they make more money if government grows. But someone has a plan to do something about this: Scott Walker. This Investors Business Daily article by economist Veronique de Rugy explains what he would do to the unions if elected President in 2016. It would do that by expanding employee choice and holding unions accountable to their members. One of the main underlying themes of the Republican presidential hopeful’s private-sector reforms is transferring power and decision-making from unions to their members. For instance, the plan would guarantee employees’ rights by strengthening secret-ballot elections. Under current law, unions have ways to work around the protections, making such elections less than secret. The change would protect workers from retaliation by not disclosing their choices to unions during workplace elections. Though federal laws outlaw extortion, the Supreme Court has ruled that they usually do not apply to unions. Walker’s plan would change that to protect workers from threats, violence and extortion from unions. Similarly, his reforms would protect whistleblowers who report wrongdoing on the part of a union from being fired or discriminated against. […][Public sector unions]… also make the government less effective and more expensive. That’s why a President Walker would work with Congress to prohibit public employee unions altogether. Meanwhile, he would implement taxpayer and paycheck protections. As Heritage Foundation labor economist James Sherk explained for National Review, “Walker proposes cracking down on the use of ‘union time’ — that is, allowing federal employees to work for their unions at taxpayer expense. Walker’s plan also would establish a nationwide right-to-work law, making voluntary union dues the default option for all private- and public-sector workers. It would give workers the freedom to choose whether they want to be in a union or not. States that want to take this freedom away from their workers would have to affirmatively vote to opt out of right-to-work status. […]The Walker plan includes many more reforms, such as a repeal of the Davis-Bacon wage controls, which alone could save taxpayers nearly $13 billion over the next 10 years. If implemented, it would be a giant step toward freeing businesses, employers, workers and taxpayers from the incredible burden imposed on them by federal labor laws and union bosses. Why should we believe that he’ll really do it? Well, unlike some of the talker candidates, Walker has already done it in his state. And it worked – a $3.6 billion dollar deficit was erased. If you are concerned about the growth of government, and all that that entails, e.g. 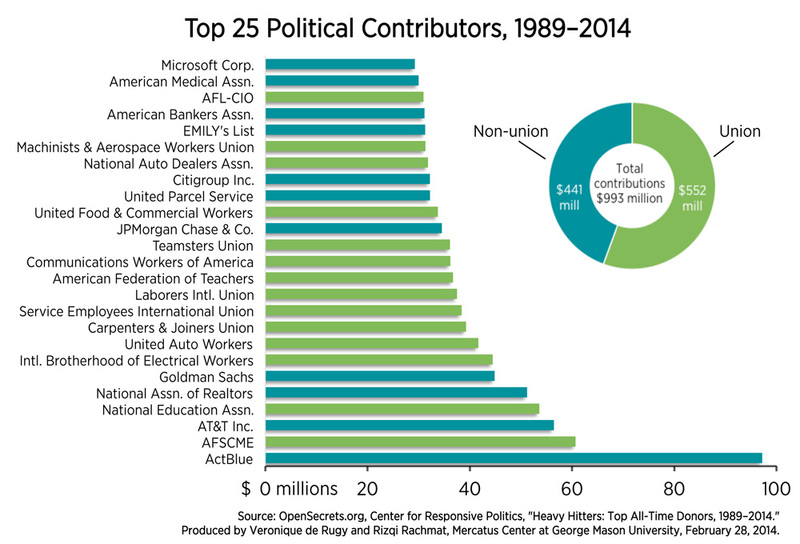 – higher taxes, massive spending, bloated welfare state, huge levels of corruption, government waste, abortion, gay marriage, etc – then you should know that all of that is driven by the political donations of unions. And I don’t want anyone to think that union workers are the same as union bosses. In Wisconsin, as soon as the union workers got the right to work without having the pay union dues, the vast majority of them chose not to pay union dues. This really is solid plan to reign back in union control but unfortunately my pencil sharpener has more charisma than Scott Walker which is why he’s polling down in “Lindsey Graham-Jim Gilmore-George Pataki” land at a dismal 0% in the latest CNN/ORC poll. I find it EXTREMELY annoying that conservative voters simply won’t provide support for a candidate based on record alone instead they also have to be “charmed” by a charismatic politician as well as have a solid conservative record. It is very sad that such an effective conservative governor in a blue state is struggling in the polls amongst republican voters. As much as I want him to take the nomination, the odds are by my no means in his favor to do so. At this point do you think supporting his campaign would be a fools errand because he’s yet to electrify the republican base? The bottom line is this is how our national politics works in America and it is not going to change anytime soon. We simply must accept that our nominee has to have some level of charisma AND a proven record based upon prior conservative actions if we’re to beat the dems for the White House. Maybe he can be Secretary of Labor, if we get a good conservative President like Ted Cruz or Bobby Jindal. Walker’s out! Looks like Labor Sec is becoming more realistic. I’m crying wintery tears that turn to icicles. Unreal! Oh well, at least there’s Trump. :-( God help us. Any chance of getting Jindal off the kiddie table and putting Paul there since he looks like a kiddie anyway?